Josh Weller is as hot at the August heat right now with the United Racing Club. Fresh off of an 18 to 5 place and hard charger at Williams Grove to winning at Susquehanna Speedway from the 4th position on Saturday night, Weller rolled into Bridgeport Speedway for a Tuesday night special paying $2,000 to win thanks to Valley Forge Inc and GEI Enterprises kicking in an extra $500 for the win. With a field of 17 cars in the pits for the Tuesday night show, 2 heat races were needed to complete the line up for the 25 lap A-Main. Heat race #1 was won by the Quality Auto Body #89 of Robbie Stillwaggon who was still suffering some physical effects from his crash on Friday night at the Williams Grove Speedway and heat race #2 was won by the 2014 URC Champion and current points leader the Franek Auto Sales #28f of Davie "No Panic" Franek. After Heat race #1 winner Robbie Stillwaggon drew the "6" invert pill, the front row was set with Weller and the Fall Proof Fall Protection, Bitner Automotive, K&N Filters #15 of Mr. Twister Mark Bitner. Right from the drop of the green, Bitner out drug Weller going into turn won and was shown the leader of lap #1. Bitner carried the lead until lap 4 saw the first and only caution of the race, unfortunately it was the leader Mark Bitner who rolled to a stop in turns 1 and 2. Bitner later reported motor problems put an early end to his great run. With Weller now in command, the driver of the Victory Auto Glass #63 picked the outside of row 1 heading to the restart. Weller quickly took command of the lead and went and hid for the remaining laps. Weller parked the #63 in victory lane and completed his traditional wing dance. Following Weller to the line was current points leader Davie Franek, the GEI Enterprises, Valley Forge Inc #5g Curt Michael, the R&S Concrete Paving and Site Contractors #47 of Adam Carberry. 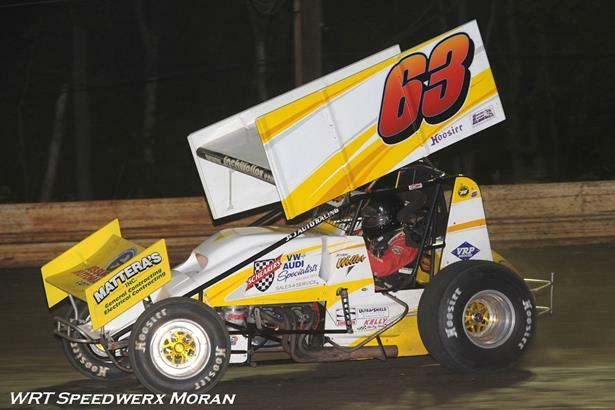 Carberry who expired a motor on Saturday night at Susquehanna quickly contacted former 360 driver Eddie Wagner for the purchase of his SEC Racing Engines motor. Carberry had just enough time to pull the old mount from his #47 and place the new motor in before heading to the track on Tuesday afternoon. Rounding out the top 5 was the B&G Auto Glass #22 of Troy Betts. The Untied Racing Club will now complete a 4 races in 8 days swing when they head north to Middletown NY and the Famed Orange County Fair Speedway on Saturday night. Franek continues to lead the 2016 United Racing Club Points followed by Stillwaggon and 9 Time URC Champion Curt Michael.